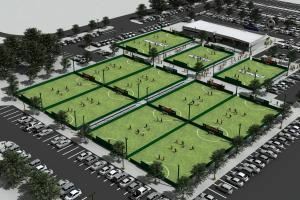 We are a state of the art academy style soccer facility with 10 floodlit artificial turf fields, that can host from small company events and soccer tournaments to larger events with over 100 teams. Our corporate office is located in Scotland, with over 40 facilities in the UK, and the first built serving the Los Angeles area. Our facility boasts large locker rooms and showers, "Offsides" soccer store, Viva Mex Grill, large lobby area with TV's, small party room for smaller events, deck, and free wi-fi. For more information or quick tour, please do not hesitate to contact us. We have hourly rates for our fields, and special rates for larger parties and company/corporate events. Recently we have hosted events for In n Out Burger, Farmer John, and Univision, as well as a commercial shoot with David Beckham. You can check videos of our center online at http://www.youtube.com/GoalsSoccerCenter . Please let me know when would be a good time to speak with you regarding an opportunity to work in conjunction with your organization.